'’Tis the season to be jolly. And a little shady! Ginger Minj brings comedic holiday cheer to the Laurie Beechman in her latest holiday show, Mary Did You Hear? Joined by friends Michael Kirk Lane and Janine Klein, Ginger sprinkles holiday memories through comedic anecdotes in a stocking full of fun. Mary Did You Know? 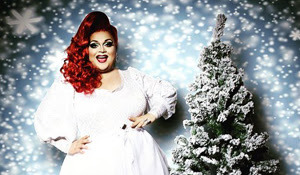 is a night of Christmas memories and holiday songs curated by Ginger Minj. Putting a new spin on "Mary, Did You Know?," they three Queens, arriving on stuffed camelback, share slightly skewed holiday gossip about one another. It's a loose through line that's nothing short of silly. The "plot" occasionally flies off the handles but Ginger is there to reign it back in as best she can. The night is all about the cute gimmicks. Some land. Others? Not so much. From parodies to mocking sappy Christmas songs to brilliantly layering “You Spin Me” by Dead or Alive on top of "The Dreidel Song," Ginger has a present for everyone. The extra special tree topper was a special appearance by RuPaul Drag Race Season 4 icon Jiggly Caliente. Ginger joined Jiggly to sing her newest holiday hit "XMas Hams," which is featured on the Holiday Queens 2 album. Those wishing to hear Ginger sing her track from the album will be greatly disappointed. The make up of the audience is a majority of Drag Race fans so anytime there is tea spilled, the crowd went wild. The same went for the banter with Jiggly. It rocked the house. Any jabs to their fellow sisters git some of the strongest reactions. While this was Ginger's show, her trusty sidekicks were a wonderful addition. Janine Klein and Michael Kirk Lane added a jolt of extra hilarity, becoming fun foils for the overly jolly Ginger. Mary Did You Know? was a great way to kick off the holiday season. It may not have been the best package under the tree but it certainly resulted in smiles and Christmas glee.